Former Massachusetts Gov. Mitt Romney, Republican nominee in the 2012 U.S. presidential election, is being touted as a prospect for nomination as U.S. Secretary of State in the Trump administration. President-elect Donald Trump will meet this weekend with one of his fiercest critics: 2012 Republican nominee Mitt Romney, a discussion that could include the position of secretary of state. 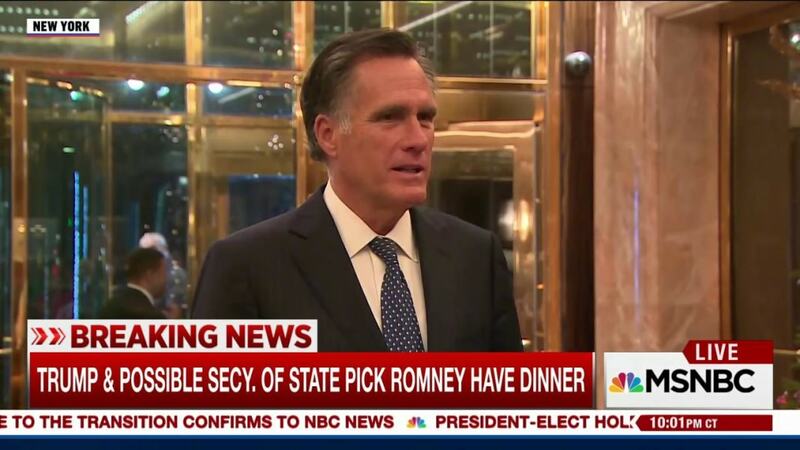 … Romney has long told friends that he would like to serve in government again and the one job he is interested in is secretary of state, a senior Republican with knowledge of the transition tells CNN. Based on his psychological profile, Gov. Romney earns high marks for temperamental fitness and would be a safe choice for the position. 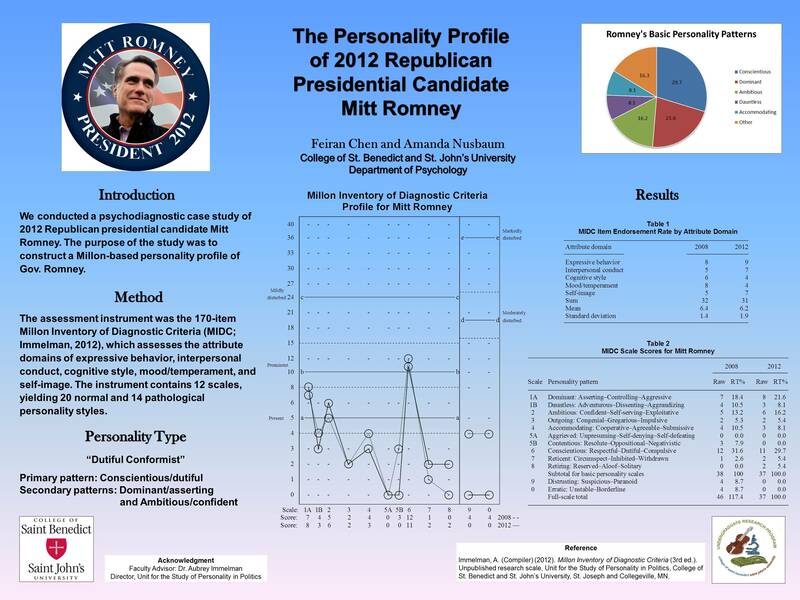 Romney fits the profile of the dutiful conformist. 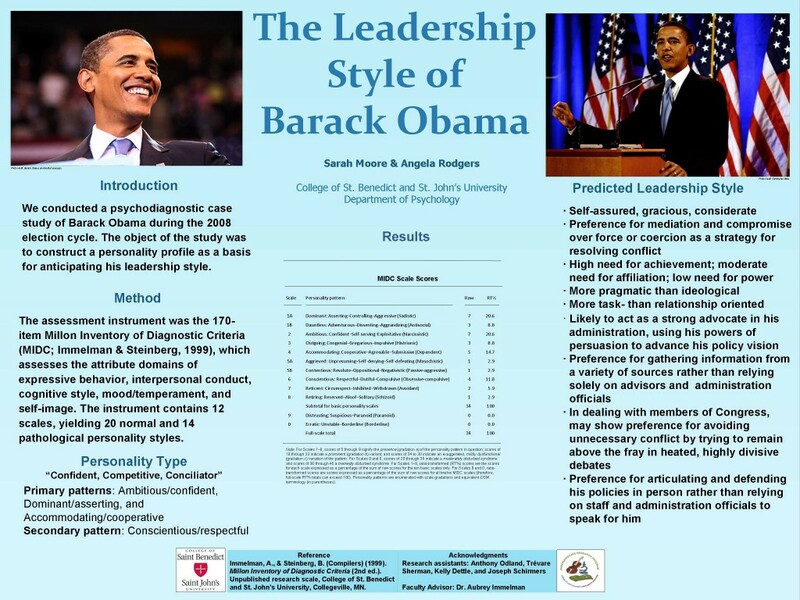 Leaders with this particular personality profile are characteristically prudent, proper, dignified, dependable, and more principled than most personality types. They are highly organized, with a strong work ethic and careful attention to detail, which accounts in part for Romney’s resounding success in organizational and corporate management and financial restructuring. Former New York mayor Rudy Giuliani, a contender for the Republican nomination in the 2008 U.S. presidential election, has expressed strong interest in being considered for this key cabinet post. Based on his psychological profile, Mayor Giuliani would be a riskier choice for Secretary of State, despite the fact that he is close to President-elect Donald Trump. Giuliani fits the profile of the aggressive enforcer. Leaders with this particular personality profile are characteristically tough and uncompromising rather than diplomatic, with a forceful style that permits them to take charge in times of crisis. Former Massachusetts Gov. Mitt Romney, Republican nominee in the 2012 U.S. presidential election, has announced his candidacy in the 2018 midterm election as Republican candidate for United States Senate to fill the vacancy created by the retirement of Utah’s Sen. Orrin Hatch. Romney fits the profile of the dutiful conformist. Leaders with that particular personality profile are characteristically dignified, dependable, deliberative, prudent, proper, and more principled than most personality types. They are highly organized, with a strong work ethic and careful attention to detail, which accounts in part for Romney’s success in organizational and corporate management and financial restructuring. Why would Romney run? (Chris Cillizza, CNN, Feb. 16, 2018) — What makes Mitt run? That’s the question CNN editor-at-large put to Scott Helman, an editor at the Boston Globe and longtime “Mitt-storian.” Helman co-autored The Real Romney about the life and times of the two-time presidential candidate. 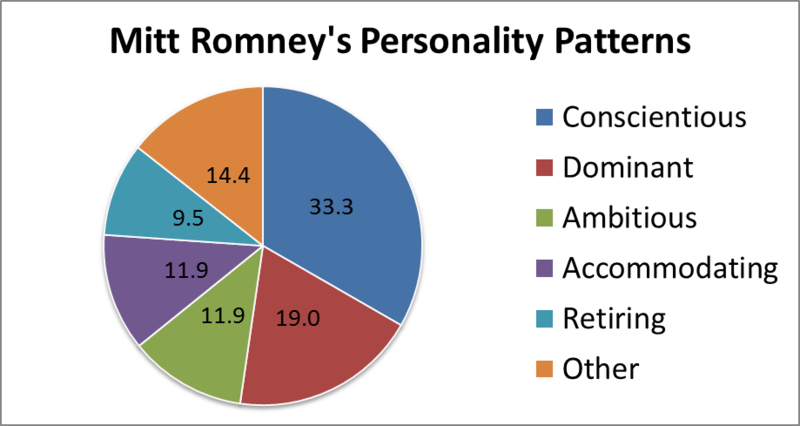 As shown in the pie chart, Romney has a primarily Conscientious-dutiful personality, complemented by secondary Dominant-asserting, Ambitious-confident, and Accommodating-cooperative features and a minor Retiring-reserved tendency. 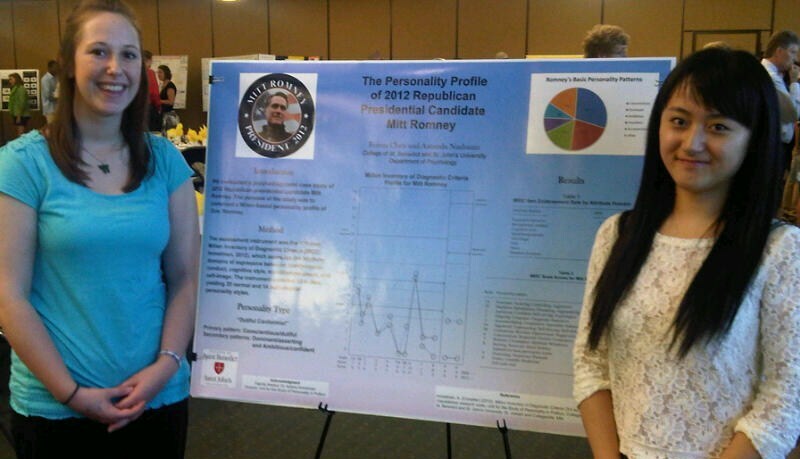 Research assistants Amanda Nusbaum and Feiran Chen presented their research on “The Personality Profile of 2012 Republican Presidential Candidate Mitt Romney” at the College of St. Benedict in St. Joseph, Minn., July 30, 2012. 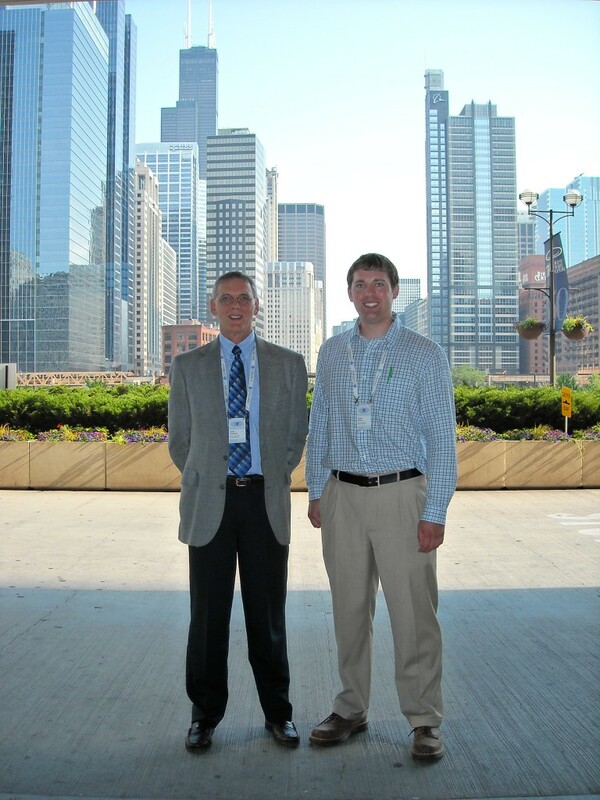 Click here to visit the former USPP site, with content between 1999 and 2008.